Summary: "Don't give up." A celebration of some badass characters of color in recent science fiction, fantasy and horror TV and movies. Made for resolute as part of the Fandom Trumps Hate 2017-2018 charity auction. More info at AO3 (including a list of fandoms & spoilers). 52 LGBT Superheroes and Villains. So, is anyone else going to ComicCon on Saturday? Now, in case you're scratching your head, that's because it's a very local one... See under cut for poster etc. Post by Phil Sandifer here. "I love your list in DWM 482 of the Doctor’s many wives. Did you ever think we’d be having that conversation, 10 years ago? But… what’s this? His marriage to Queen Elizabeth the First was unconsummated? But, but, but… in The End of Time Part One, the Tenth Doctor arrives on the Ood-Sphere to greet his old friend Ood Sigma with the words, “Got married. That was a mistake. Good Queen Bess. And let me tell you, her nickname is no longer… ahem.” So, what does that mean, boss? What can it possibly mean?? Steve, what does it MEAN??? Thank you." Please, tell me that the Doctor and the Master don’t suddenly have some romantic relationship now that one of them is a female?? I just don't even know where to START. After YEARS of having Moffat be accused of misogyny, he is now being accused of sucking up to the feminazis. Link(s) under cut, as there are SPOILERS for Dark Water. I'm not good at this, but I figure it can double as a 'If you ever had any questions, go on and ask' posts. I work fulltime in a local College (mostly 16-18 year olds) in an admin position. Oh and I live in England if that wasn't clear. (Used to be a stay-at-home mum when the girls were small, so I still wonder where all the time went.) Did a foundation course in Art a long time ago. Still love art, but love writing more, I think. For fannish stuff, then there's links on my sidebar to selected fic/meta and Master Posts. Both BtVS/AtS & Doctor Who & Torchwood. Although my heart belongs to Eleven, I am still exceedingly fond of Ten, and he was the one who first made me fannish about Doctor Who. <3 My very small claim to fame is that I wrote an essay for Chicks Unravel Time. 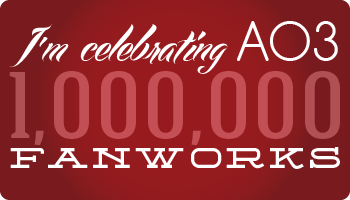 AO3 Reaches 1 Million Fanworks !!! But nevermind that - congrats to AO3, and well done fandom! Your story could make a difference. From OTW: Your Personal Fandom Stories Are Urgently Needed! The Legal Committee is thus looking for stories of how fandom has helped fans in day-to-day life. We need you to share your individual stories with concrete examples. For example, perhaps being in fandom has helped you to learn a language, helped you in school, or helped you improve skills that you use elsewhere — skills such as writing, video editing, coding websites, audio editing, or anything else. We don't need personal information from you, but the more specific the story, the better. Fangirl Isn’t a Dirty Word by our very own Debs. It’s not easy being a modern fan. We’re battling decades of institutionalized sexism, racism, and imperialism. We’re working on it. We may still be struggling with all of the —isms but we’re clawing our way toward second wave fandom, particularly when it comes to female fans sharing the dais. We recognize that women really do game, read comics and geek out over all the things guys geek out over. But even in this enlightened age, the gendered term “fangirl” has become a casual slur, used with impunity to mock and ridicule a certain type of fan. There is also a podcast: Verity! Extra! – Fangirls Just Wanna Have Fun. Re. Amazon wanting to publish fanfic... Please tell me someone remembers FanLib? The pinata donkey? Blue guy and pink guy? Shows & their fandoms. Summed up in gif form. Genius. Was sad that Martha lost out to Joan Watson in the Final Four (am sure Joan is a fine woman, but she's neither under-appreciated, not did she save the world all on her own), when it occurred to me that there's been an awful lot of women in FFM this time round. Going back, I discovered that even Sweet Sixteen only had one male contender. The battles (when I've managed to skim a little) seem to have been mostly centering around 'My Strong Female Character is more awesome than yours!' - and just how awesome is that?